We are so excited to announce our 2016 Ride the Brainwave Concert lineup for June 11, 2016 at our new venue The Salt Lake County Equestrian Park. Save the date!!! 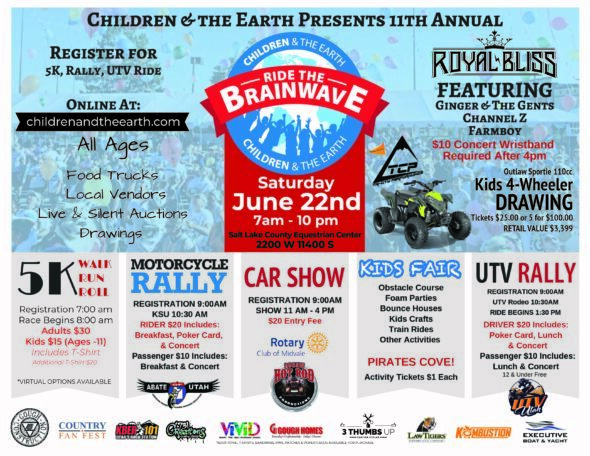 Please join Children and the Earth for our 8th Annual Ride The Brainwave 5k, motorcycle Rally, and concert series. Please join Children and the Earth for our 7th Annual Ride The Brainwave 5k, motorcycle Rally, and concert series, to be held June 13, 2015.